Call us at (631) 482-0075 or (631) 964-2787 to get your New York State Security Guard Certification! Note: If you experience any technical difficulties with either of the below forms, just send us an e-mail with the details of when you want to come to class(es) or you may call us at (631) 482-0075 or (631) 964-2787. In any event, rest assured that we will notify you if this should happen. We had to institute this policy due to a large number of irresponsible people in the past who were "NO SHOW/NO CALLS" or canceling last minute. Initial course required to get security guard license in New York State. Level I or Level II Executive Protection (Bodyguard) Course fee. For those who take the NYS Sixteen Hour On-the-Job Training Course within 14 days of taking the NYS Eight Hour Pre-Assignment Course with us. Annual course required to renew security guard license in NYS. Course required within 90 days of initial employment as a security guard. 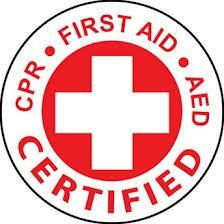 First Aid-CPR/AED double certification course (AGA member rate). FOR CANCELLATION POLICY (NYS SECURITY GUARD COURSES) CLICK HERE.